WHY AUTO TECH STARTUPS HAVEN’T BEEN A HOT INVESTMENT LATELY: 240 different startups focused on connected and autonomous car technologies have raised just over $US5 billion from both corporate and private investors in recent years, according to a new Reuters analysis of funding in the space. But that is just a fraction of the money that has been spent on these technologies — Reuters estimated that automakers and tech giants have collectively spent $US40-50 billion on developing autonomous and semi-autonomous car technologies. Investors interviewed by Reuters were split on whether auto tech startups will start to capture more of the money being spent on these technologies soon. There’s little doubt that connected and autonomous technologies will disrupt the transportation space and create new opportunities for upstarts. 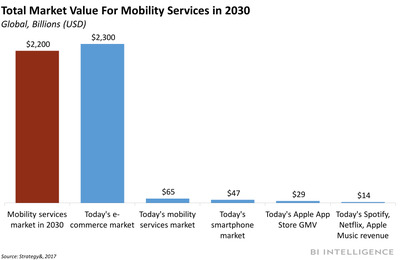 Self-driving cars will enable a new market for digital services, including autonomous ride-hailing and in-car streaming media services, that will be worth $US2.2 trillion by 2030, according to Strategy&. Tech companies and startups are widely expected to play a key role in that market. Only 15% of 80 auto and tech executives surveyed recently by legal and advisory firm Foley & Lardner LLP said that new entrants are not disrupting traditional auto companies. Additionally, 22% of the auto executives surveyed predicted that tech startups would become their primary competition within the next three years. The vast majority of the money being spent on developing these technologies is going towards internal self-driving projects at giant automakers and tech companies, including Ford, GM, Intel, and Waymo. Additionally, the auto tech startup space has grown incredibly crowded. The $US1 billion price tag that GM paid for small self-driving software startup Cruise Automation last year has led computer vision and robotics experts to flock to the space and found new companies, Reuters said. Acquisitions have been growing though in the past year. Some major auto companies have spent heavily to acquire startups, including GM’s Cruise acquisition, and auto supplier Delphi’s recent $US450 million acquisition of self-driving startup nuTonomy. However, with the space so crowded, it’s difficult for investors to pick winners. Additionally, major auto and tech companies are only acquiring startups that help them accelerate their own self-driving car initiatives. For example, GM recently purchased Strobe to help it make cheaper LiDAR sensors, an important step for the automaker to start mass producing self-driving vehicles. Last Friday, Ford purchased LiDAR sensor manufacturer Princeton Lightwave for the same purpose. These types of acquisitions will likely grow more frequent as automakers and tech companies close in on bringing self-driving cars to market. 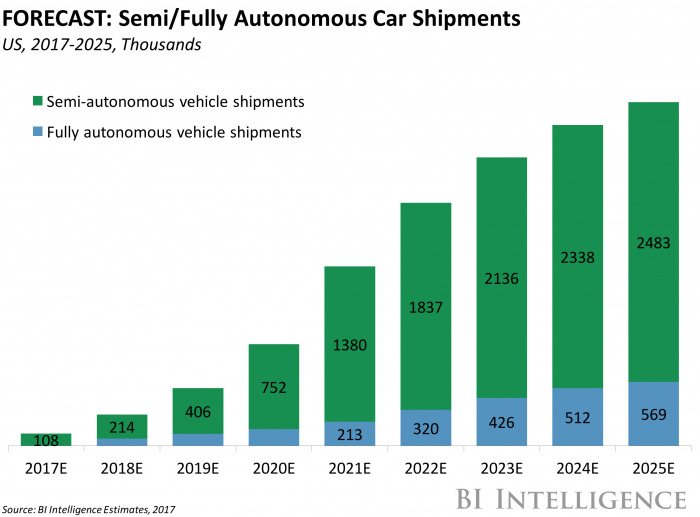 However, only startups that can add specific value to ongoing self-driving car projects are likely to find corporate buyers and investors. MOBILEYE ACQUISITION ALREADY PAYING DIVIDENDS FOR INTEL: Chip designing giant Intel discussed its recent acquisition of Israeli advanced driver assist system (ADAS) designer Mobileye on its Q3 Earnings call late last week. The company announced the $US14.5 billion acquisition back in March. The chip giant completed the Mobileye acquisition in early August, about four months before it initially expected the deal would be finalised. This allowed Intel to collect $US80 million in revenue and $US39 million in operating income during the quarter from the Israeli company, Intel CEO Brian Krzanich said on the call. For context, Intel earned $US4.5 billion in total revenue for the quarter. Krzanich also said that Mobileye has secured 14 ADAS partnerships with automakers so far this year, which is already more than the 12 it secured during all of 2016. This includes automakers such as Audi, which is integrating Mobileye’s technologies and Intel’s computing systems into its A8 sedans, and Volvo, which is integrating the technologies into its XC90 SUV’s. Additionally, the company announced a slew of new partners this past quarter that are now using its technologies to build self-driving cars during the quarter, including BMW, Google’s Waymo self-driving car spinoff, and Fiat-Chrysler. Mobileye will grow even more valuable for Intel as these partners move towards deploying Level 5 autonomous cars in the coming years. Waymo and BMW, in particular, are racing ahead to deploy Level 4 self-driving cars as soon as possible, but are simultaneously working to eventually deploy Level 5 autonomous cars several years from now. Level 4 autonomous cars are designed to operate autonomously in most scenarios, but still have a steering wheel and pedals for a human operator to intervene in case of emergencies, while Level 5 cars are fully driverless and ditch the steering wheel and pedals. As automakers work towards Level 4 and Level 5 cars, they will need more advanced sensors, cameras, and computing systems, which Intel can supply. That could help Intel draw more auto partners and push its automotive revenue to become a much larger share of its overall business, which Krzanich noted the company is already doing by leveraging Mobileye’s existing partners. PARROT HOPES NARROW FOCUS WILL FUEL TURNAROUND:French drone manufacturer Parrot has unveiled two new aircraft, Engadget reports. The Bebop-Pro Thermal that comes equipped with a thermal imaging camera, runs software designed to help identify humans, and is designed to be used by firefighters.The drone, which is an updated version of the original Bebop, has a wingspan of about two-and-a-half feet, and will be available for $US1,400 starting next month. Firefighting is a leading public safety use case for drones, giving the drone model a fast-growing market. The Bluegrass, which comes equipped with a mutispectral sensor and flight planning software and is designed to be used in agricultural settings. The drone, which will cost about $US5,000 and also be available sometime next month, can fly across 74 acres of land on a single charge. The aircraft is Parrot’s first major foray into the agricultural drone space, which Goldman Sachs estimates has a $US5.9 billion global addressable market through 2020. The company likely hopes this narrow focus will help it avoid being crowded out of the drone space by Chinese rival DJI after a year where its struggled to crack the Chinese giant’s dominance.DJI accounts for about 75% of all registered drones in the lucrative US market according to BI Intelligence’s latest estimates, making life difficult for smaller competitors like Parrot. The French dronemaker cut 290 jobs earlier this year — or about one third of its workforce — after several consecutive quarters of missing its sales targets. The company is betting that designing its drones for these very specific use cases will allow it to find a valuable niche in the market. Uber unveiled its first ever co-branded credit card with BarclayCard US last week, according to The Verge. The card offers customers a $US100 bonus after they spend $US500 on any purchases in their first 90 days, 3% cash back on restaurants and bars, and 2% cash back on Uber rides. 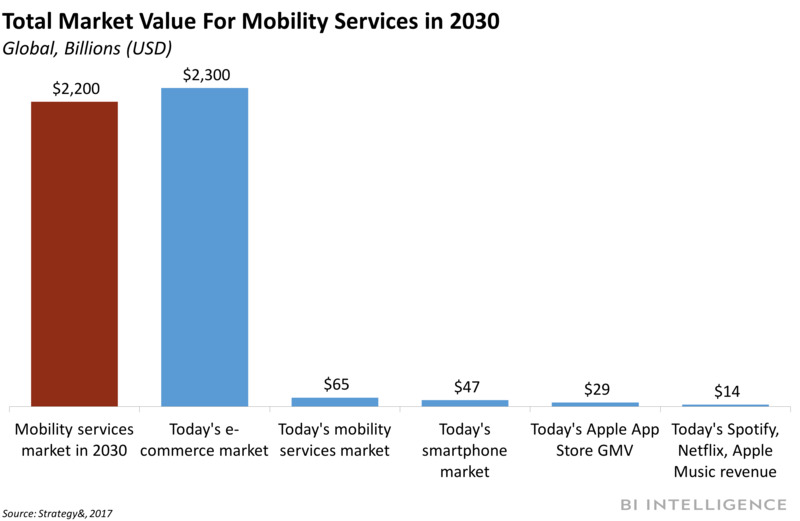 The ride-hailing giant likely hopes the card will boost customer loyalty at a time when rival Lyft is slowly eating away at its domestic market share. GE is considering cutting ties with its railroad business, which it houses under its GE Transportation unit, amid pressure from investors for the conglomerate to cut costs and abandon low margin businesses, according to The Wall Street Journal. The company is considering selling, spinning off, or even looking to partner the business unit, known as GE Transportation, with another company in the industry. The unit is one of the conglomerate’s oldest, and its revenue and profits have been declining for several consecutive quarters. UPS plans to invest millions of dollars to upgrade its logistics network, including adding five million square feet in new fulfillment centres, and buying larger planes and more trucks in order to keep up with rapidly rising e-commerce package volume, The Wall Street Journal reports. In addition, the company is considering expanding its currently small Saturday delivery services, CEO David Abney said on the company’s earnings call last week. The logistics giant joins rival FedEx in spending big to upgrade its network and cope with the rise of e-commerce. Click here to receive a FREE download of The Top 5 Disruptive Trends Shaping Transportation and Logistics from BI Intelligence, Business Insider’s premium research service.